Happy Monday everyone, I hope you had a lovely weekend! I cannot get enough of boyfriend jeans lately, which is super out of the ordinary for me. I'm usually a high-waisted skinnies girl all the way, but it's safe to say I've fallen in love with this style! Only 2 more days to enter my Hobo Giveaway! Love your jeans! Hope you had a great weekend! 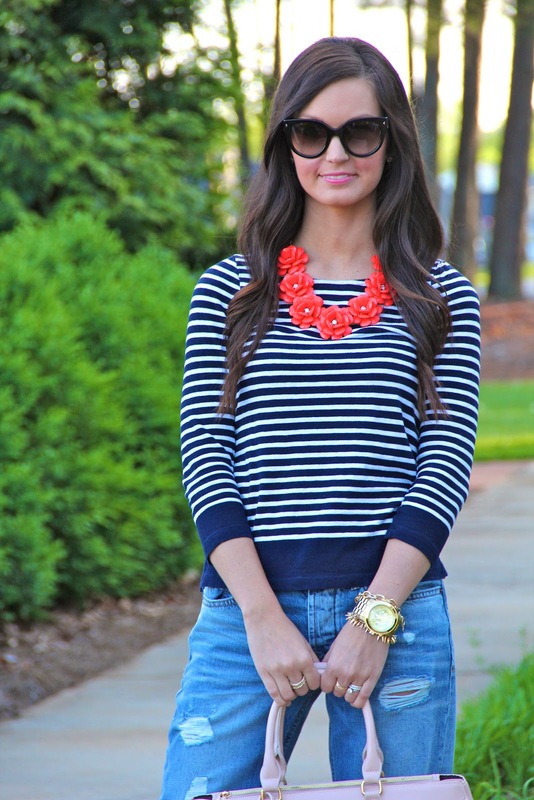 love your stripes and that cute rosette necklace! Love that pop of color !! I love the pop of color from the necklace, I'm also loving those boyfriends jeans. I've been on the hunt for a pair, so I will have to check these out. I love the bf jeans on you! I wish they had my size...I've been hunting for a pair at a good price. This is adorable. I love all things stripes and navy. Love the sweater with the necklace! I recently got a pair of boyfriend jeans and I am loving them too. Normally not my style, but they are cute and comfortable! This is such a great look-- I love it! That necklace really pops against those stripes. Love it! Love this look and that necklace!! 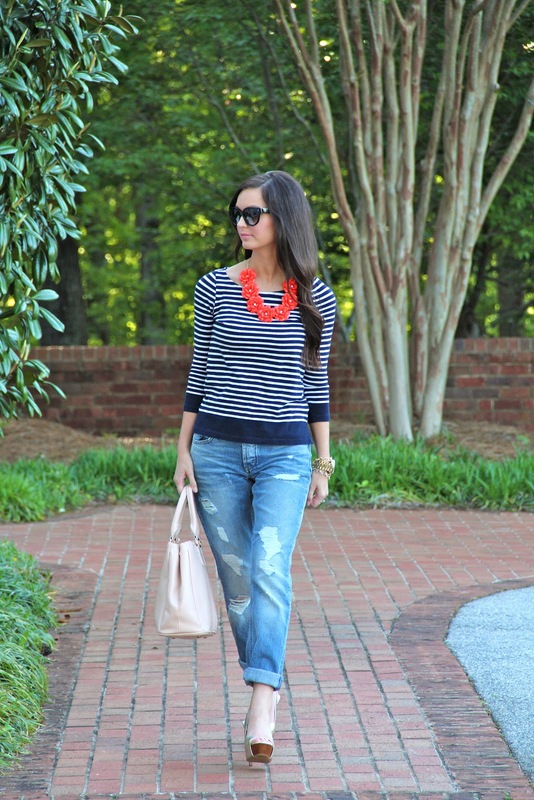 Loving the coral necklace over the navy sweater! It gives it the perfect pop of color! I am in love with the necklace and the top! 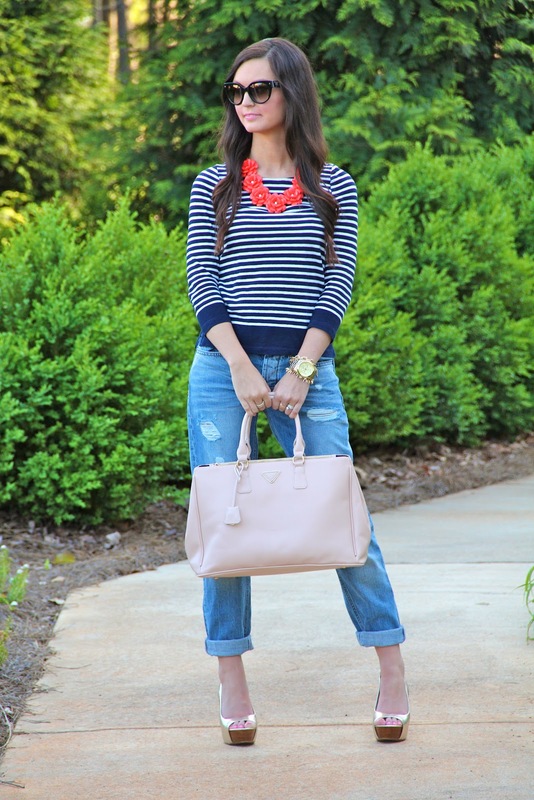 I am loving the necklace and the stripes together! Totally gorgeous. Love your stripes and that necklace is so beautiful!!! So obsessed with that J. Crew necklace - you look fabulous Megan! love this look - especially that J. Crew necklace. Obsessed with it! That necklace just stole my heart! Obsessed!